2011 July – The Nuge. How do they do anything when they have tyres for hands? I re-watched Cars recently and this detail bugged me. How did these cars evolve in a universe where they can’t use rocks for tools? THE BASTARDS DON’T HAVE OPPOSABLE THUMBS. I’m watching a cutesy scene where Lightning McQueen, a sentient, self-aware car, is learning the many benefits of old-timey small-town friendship and all I can think of is how the hell did this species of cars, that’s cars, develop such an advanced civilisation? 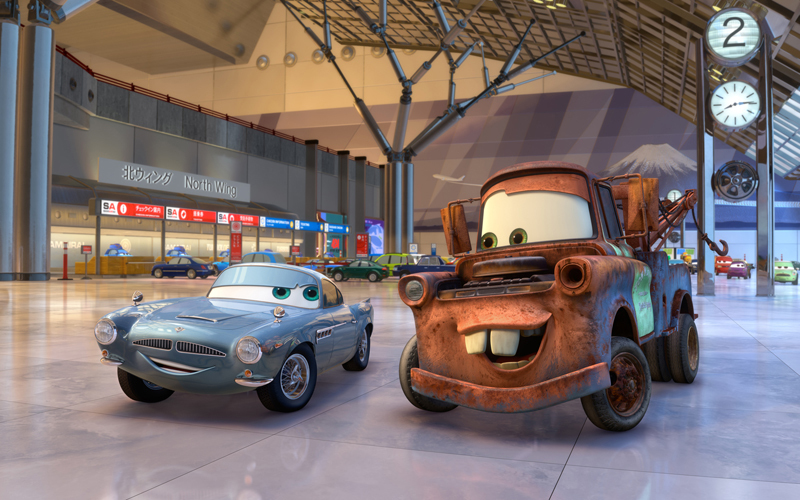 If Lasseter and his cronies had any respect for evolutionary biology, Cars would be ninety minutes of ape-like cars bashing into each other, beeping a lot and never entering the stone age. 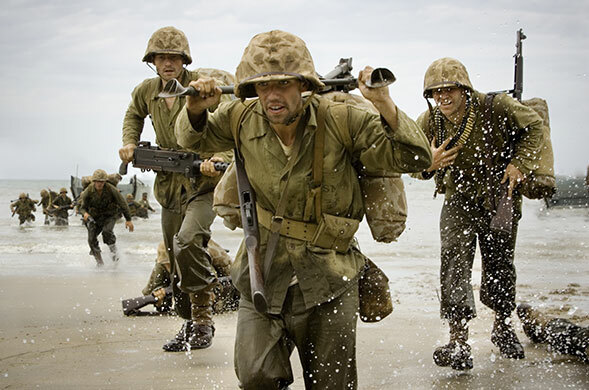 Way back in March 2010 I wrote a five-star, 1000-word, gushingingly sycophantic review of the first two episodes of The Pacific, the latest mega-budget World War II-set mini-series from premium cable quality-telly merchants HBO. Being an unabashed diehard fan of the series’ earlier companion piece, Band of Brothers, my anticipation was extremely high, so when the offer came to attend the UK premiere of the first two episodes, I jumped frenziedly at the chance. Now, well over a year later, I’m finally catching up on the rest of the series, and with hindsight, I may have been a little bit premature to describe it as a “classic in the making”. (In my defence, the premiere was very exciting, and I was still new to the glitz and glamour of journalistic perks. It was at the O2! It was on a massive screen! The vice-president of Sky Movies HD did a little talk! I got a free goody bag! PR companies: if you provide any or all of the above, you are guaranteed an effusive, integrity-be-damned, five-star review from this writer.) I’m up to episode six, out of a total of ten, and it’s yet to grab me in the way it’s sister managed so well. My main qualm is that I haven’t connected with the characters yet. Like most war stories, the focus is on a few heroic privates. One of the great strengths of Band of Brothers was an immediate array of recognisable, likeable, distinct protagonists (all, like The Pacific, based on real soldiers). The gun-ho-ness of Sgt Bill Guarnere contrasted wonderfully with the softly-spoken heroics of Damien Lewis’ Major Richard Winters, or the slow descent into alcoholism of Cpt Lewis Nixon. This close relationship between character and viewer is all but lost in The Pacific. Part of the problem, I think, is that the source is more scattershot. Brothers was entirely based on the non-fiction book of the same name by Steven E Ambrose (which I am not in the least bit ashamed to say I have read twice), focussing on the exploits of one company in the Paratroopers, from training to VE-Day, via Normandy, the Bulge and Hitler’s Austrian hideaway. The Pacific, meanwhile, takes its source from the diaries and memoirs of three separate Marines, whose paths occasionally cross as they battle in Australasia. We don’t focus on one hero, but three, and never spend enough time with any to befriend them properly as an audience. Only Leckie, the erudite writer played with skill by James Badge Dale, comes close, and even then he is too schizophrenic, flitting between personalities and character traits. The three-strand narrative makes things a little convoluted, and all too often, incoherent. War is messy, violent, disorganised, and choatic, and it takes storytellers of real skill to fashion a well-constructed narrative out of it. The makers of The Pacific flirt with genius – the gobsmackingly visceral battle scenes remain absolutely unrivalled, in television or cinema – but they fail to tell a story with a clearly defined vision of what they’re trying to say (beyond the regulation ‘war is hell’ boilerplate), or who they’re trying to communicate it through. I’ll hold out final opinion until I’ve seen the whole series, but unfortunately I can’t see The Pacific holding the same sacred place it occupies on my DVD shelf, rolled out every six months for a weekend marathon. performing arts’ remains as vibrant and relevant as ever. Of course, there’s always annual chatter of concern that the festival, which has become an unlikely national institution, is suffering from a slow decline in quality in. Aging hippies and travellers continue to mourn earlier, less commercialised incarnations of the event, and grumble about the heavy security and the infamous million-pound ‘superfence’, ostensibly there to keep the riff-raff out but, some argue, trampling on the older, freer spirit. The street artist Banksy, a regular attendee, put up a sign one year which read ‘Queue here to complain festival is not as good as it used to be’, strategically hung over a muddy ditch. It’s true that the main stages often closely resemble the average Radio 1 playlist, and if you only watched the BBC’s coverage you might be forgiven for overestimating its commercialisation. But the sheer scale of the festival defies generalisation. Glastonbury is really made up of many small festivals, each with its own individual personality, music tastes and clientele. It’s impossible to see it all, even in long weekend. You could spend a month there and still miss some hidden gems. 2011 (only my second Glasto) had some extraordinary mini-festivals on offer. The truly breathtaking late-night area, entertaining punters through the night after the main stages finish, is a sight to behold. Set over five or six fields, the highlights included Arcadia (massive fire-breathing metal spider with acrobats dancing around a DJ), Block 9 (nightclub built into a life-size urban tower block with a tube train ‘crashed’ into it) and Shangri-La (endless alleyways of installation art and obscure little bars and shops). It’s a bewildering and mind-boggling experience – especially at four in the morning. With so many easy distractions you easily forget there’s music to see – as I and my cohorts did rather a lot this year. But music there was, and the sheer range of styles and genres on offer did not fail to impress. Over two thousand acts performed at the event, with many playing as early as Wednesday, some simply spontaneously. If bongos are your taste, for example, there’s no short supply at the pseudo-ancient Stone Circle, where a seemingly perpetual hippie drum circle plays tribal rhythms around a campfire, to the hissing backdrop of recreational laughing gas being dispensed. The festival’s main programme began on Friday, with Metronomy and Two Door Cinema Club warming things up. But as stormclouds gathered overhead, it was the curious task of the Wu-Tang Clan to liven up the afternoon crowd. Sweary gangsta rappers at three in the afternoon seems like less of a strange scheduling choice after Jay-Z’s triumphant headline set in 2008, and they did a heck of a job. The Clan’s infectious energy and raucous style (basically, lots of shouting) remain unmatched in hip-hop after nearly twenty years. Chaotic, but brilliant. Later on Friday, the buzz around the site was the identity of the Park Stage’s ‘Special Guest’, and judging from the unending stream of crowds arriving hours before it was due to begin, consensus was that it would be somebody big. The consensus proved correct when Radiohead, headliners back in 2003 and 1997, played a downbeat set from their two most recent albums. The reaction was mixed; though we got our first live performance of beautiful new album The King of Limbs, those in the crowd baying for older, singalong anthems were largely disappointed. With the drizzle growing ever steadier, many dissipated for the late-night area, or bumbled off to Morrissey on the Pyramid, who was reportedly grumpier than usual that attention was not focused more on him. Saturday brought the acclaimed performance from neo-soul pixie queen Janelle Monae, whose dazzling set, broadcast on the beeb, would later trigger a big spike in album sales. Our group foolishly missed this likely-already-legendary appearance, preoccupied as we were nursing a hangover in the Green Fields. This little slice of old-school Glasto sustains a classic counterculture atmosphere; a vegan Eden with lefty shops, stages, and easily the best food anywhere on the site (providing an ideal detox). Feeling refreshed, we made our way to the second Special Guest at the Park Stage, which was an even a worse-kept secret than the last secret. But with a beautiful sunset accompanying them, Pulp were almost the anti-Radiohead. Cocker and co. blasted a joyous greatest-hits set to a enormously grateful crowd, who sang along to every word sung by the charismatic frontman, even those of us overlooking on the hill. Few songs say ‘festival anthem’ like Common People. The surprise slots were in danger of overshadowing the main attractions over at the Pyramid – U2’s Friday headline slot was ignored by the under-30s and lambasted by tax activists. On Saturday, Coldplay put on an explosive, firework-heavy show, in spite of their bland material. But it turned to pop superstarlet Beyonce to close the festival in style on Sunday, doing what her husband Jay-Z did so well three years previously in uniting firm fans and newcomers alike for a hugely impressive ninety-minute set. You didn’t have to be a pop aficionado to appreciate the magnificent soul-infused spectacle from Ms Knowles and her all-female band. She managed to turn cynical indie geeks like me into genuine admirers; no mean feat. Unfortunately, I only caught the first twenty minutes of her set, before calling it a night – five solid days of partying was catching up with me, and earlier that day – the hottest day of the year – I was hit with a minor bout of heatstroke. Glastonbury is an experience that people talk in terms of survival as much as anything, and there is a war veteran mentality amongst the survivors, particularly in a muddy year. As I queued up for the long journey home, there were moments of silent acknowledgement between tired strangers – that despite the elements, we had been through something special. 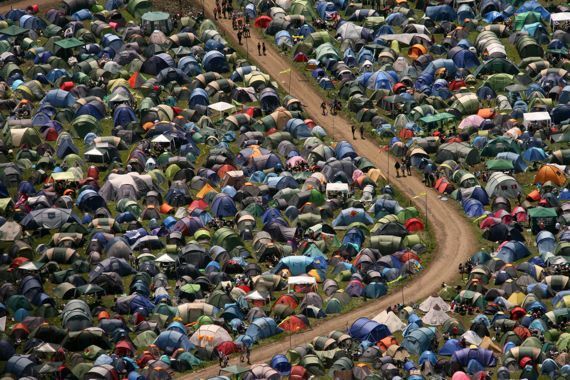 Michael Eavis has suggested recently that Glastonbury may not have many years left. Let’s hope he’s wrong. This article originally appeared on WhatCulture.com.